Part III of this series gave several theorems concerning lossless birefringent networks and their properties. 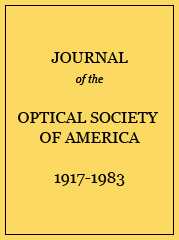 This paper uses some of these results to develop two methods of synthesizing lossless birefringent networks containing only half the number of crystals normally required. The two methods are modifications of the synthesis procedure of Part I of this series, and require fewer crystals because the light makes two passes through the network. The two methods complement each other, for in one case the output and input coincide (i.e., are spatially degenerate) while in the second case, the output and input are spatially separated.